When you plan things for a living, it’s hard to turn it off at the end of the day! 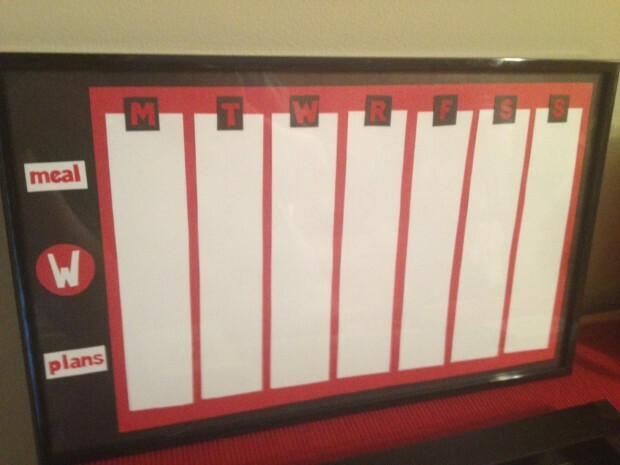 I decided to use my skills at home to coordinate the schedules of my busy family. I was inspired by a few pins on Pinterest and decided to make a customized family meal planner. This one tracks not only our dinner plans, but also our evening social plans – since we’re always on the go! I cut out the different shapes of colored paper and assembled them with double-sided tape. Then, I added words and days of the week with stickers before framing the whole thing. Now, each Sunday night, I write out our weekly plans and meals with dry erase marker. All you need is a Kleenex to wipe it right off!